Wednesday already, where does the time go? Today my card is a birthday card for my niece, I now have 4 nieces and they are all wonderful girls. My card features one of Saturated Canary's wonderful girls, this one is called Sabrina. I have been posting cards featuring butterflies for the last few weeks to help my friend, Mrs Beez, raise awareness of the charity Amy and Friends, and the work they do to support children suffering from Cockayne Syndrome. I coloured the image with Promarkers and mounted it on silver mirri and dark blue card. I then made bunting from some off cuts, I strung the pennants on twine and attached it to the card with brads. 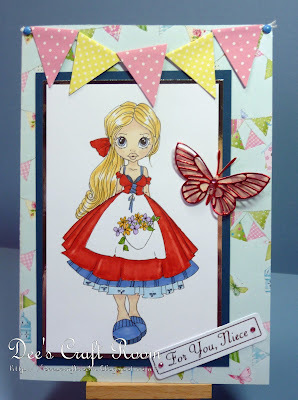 The backing paper is from a Papermania stack, it features bunting, birdhouses and butterflies. Please visit Mrs Beez's blog to find out more about the work of Amy and Friends and how Mrs Beez is trying to raise awareness of this condition. Addicited to Stamps and More - Challenge #56 - Anything Goes!!! Absolutely gorgeous card for your niece, Dionne! I am loving this one! The image is so beautiful and coloured in beautifully too. Loving the bunting and the backing paper too. No doubt your niece is going to love this one. Yes I follow you and I am leaving a comment on your wonderful card! Your creation really is pretty and I love the colors you have used. Gorgeous card Dionne. Love this image. Your coloring and choice of DP go very well together. Gorgeous card Dee. Thank you for playing along with the ATS&M challenge.